Important to almost every disability applicant is the knowledge and experience that a qualified disability attorney may provide to help obtain approval of an application for disability benefits. Otherwise, any lack of understanding of the rules and regulations involved with a disability application may cause a denial of benefits. Better to know all of your options and proceed accordingly! To qualify for Social Security Disability Insurance (SSDI), applicants must prove the existence of a severe “medically determinable” physical or mental impairment. Thus, applicants may typically only prove the existence of any impairment through medical evidence that may include objective symptoms, but requires more in the way of lab tests and other objective medical evidence. Thus, an impairment may not be established based solely on the existence of symptoms and, therefore, chronic pain that is disabling without anything more is usually insufficient to establish a disability. This objective medical evidence doesn’t need to support the severity of pain, just the existence of a physical impairment likely to cause and produce pain. As another option, somatoform pain disorder or some other properly diagnosed psychological cause of pain like a neurological disorder may meet the requirements for a medically determinable impairment. 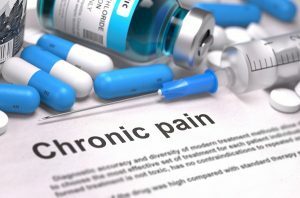 Chronic pain is not a listed impairment in the Social Security Administration’s (SSA) Listing of Impairments (the “Listings”). A listed impairment may automatically qualify an applicant for disability benefits. However, some diagnoses of certain conditions often related to chronic pain may help qualify an applicant. These include back injuries, inflammatory arthritis, inflammatory bowel disease, as well as the aforementioned somatoform and neurological disorders. An experienced disability attorney may help make this complicated assessment. Did you know that statistically, seventy percent of all SSI and SSDI claims are denied after the first application? Once disability benefits are initially denied, there is not much time to appeal this decision. Take advantage of the legal services offered by the Sullivan Law Office to assist in sorting through the extensive requirements that determine eligibility for disability benefits. The Sullivan Law Office provides assistance in ensuring that all applicants and recipients receive all of the benefits to which they are entitled in all types of disability cases. Contact the Sullivan Law Office to get the help you need in the Louisville metro area. Call 888-587-0228 or visit us online.